It could have been on any practice green in the world as a 14-year-old girl practices her putting. She is being offered advice by her caddie and her coach. Just off the green her extended family gaze upon her with pride and admiration. Her concentration is only broken as she personally greets another friend as they join the plethora of onlookers. A smile, a kind word and the traditional Thai bow is given to one and all. She even breaks into a fit of giggles as the oldest member of the entourage interrupts her coach to give her his opinion about her putting stroke. But this isn’t any old practice green and this isn’t any normal 14-year-old school girl. This is Atthaya Thitikul, aged 14 years and four months, who is practicing at Phoenix Gold Golf and Country Club, just 15 minutes before round three of the Ladies European Thailand Championship. She is sitting in second position, just one shot off the lead. So far, this week Phoenix Gold is easily the winner in the battle between golfer and golf course. Of the starting field of 126 professional golfers, only six have managed to break par, and this young amateur is one of only two players who have managed it in both the first two rounds. As she leaves the green to make her way over to course to tee off, I manage a quick word. It is actually more than that though, as she takes time to tell me that although she lives in Ratchaburi, she is schooled in a different part of the region. The exact area was of course lost in translation. At the start of the week, many of the European players stated how much they were looking forward to pitting their skills against players from a different country and a different culture. 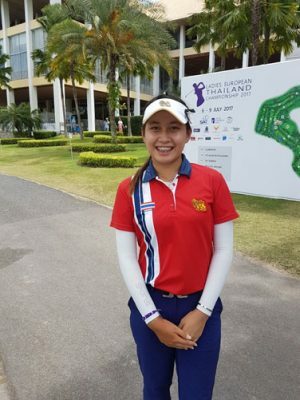 If this young lady is an example of the players they have met, then regardless of how well she copes with the intense pressure of the final two rounds, the decision to locate the tournament on the Eastern Seaboard of Thailand is a wonderful one. Atthaya is surely a potential star of the future. However, the most impressive feature of her persona is the humility that radiates from her. The quiet confidence is clearly drawn from the people that surround her and keeps arrogance safely at bay. 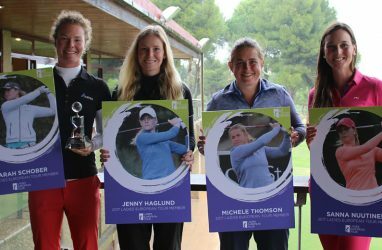 The European women are coping fantastically with the difficult conditions and the experience of playing in Thailand will hold them in good stead in the future. It will not be just about the course they have played but also about the wonderful people they have met and inspired along the way.  Article by Richard C Talbot.